Seen while out doing our bioblitz at Frontenac Provincial Park this weekend. 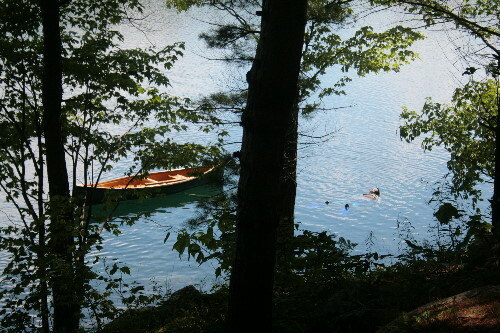 He had the canoe tied to his waist with a rope and was paddling along with flippers and a snorkel. Never once saw him take his face out of the water. Seems like a great way to spend a hot afternoon. Absolute genius. Reminds me of a story about a friend’s two dogs – a giant husky cross and a tiny poodle cross. In order to keep them both entertained and cool at the lake, they would put the little one in the canoe, and give the big one a rope tied to the bow… and he’d tow the little one around all day.